My name is Pam and I’m a hand washer. I admit it! They say that hand washing is the best defense against colds and flu but I can be a bit overzealous! And in the winter, I can suffer from extremely dry, cracked hands and cuticles. I have tried many, many hand lotions and none have really done the trick….or they’ve been uber greasy so you’re pretty much useless for at least 30 minutes…and I don’t have the time for that! Recently, I tried a product at the Shoppers Drug Mart Beauty Boutique and I was super impressed…. 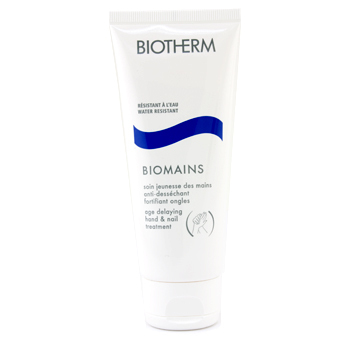 Biotherm “Biomains”. It’s an “age delaying hand and nail treatment”. That sounds pretty fancy! What I can tell you from my experience is that it’s super moisturizing, a little goes a long way, it’s not greasy (my iPhone screen agrees!) and it’s water resistant, so it has staying power. It doesn’t come cheaply though…it’s $29.50. But I’ll tell you my hand say it’s worth it because it really does work! « Knife Sharpening ~ Free for our Sisters!